Dallying In The Dirt, Issue #238--- Freezing plants follow no logical order. Ooops! It’s Wednesday. I guess I’ve accidentally? taken a week off. This issue of Dallying is last Friday’s and this coming Friday’s combined. Autumn in the garden can be just as busy as spring as we struggle to get everything tender moved inside, dig up all the potatoes and Begonia tubers and assorted other chores. The weather cools and the days get shorter and the enthusiasm seems to get cooler and shorter as well. I still remain fascinated with Mother Nature’s tricks as the frosty nights accumulate and different plants respond to those freezing temperatures. The picture has three different containers beside each other on a fence post. The Begonia in the centre is complete mush while the Petunias on either side continue to bloom happily. I really should go back to school and delve into the research of a plant’s response to freezing temperatures. 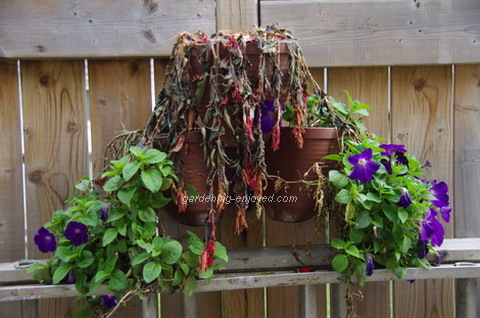 What goes on inside those little cells that allow the Petunias to survive while the Begonias collapse? Now for a little housekeeping. I happily send “Dallying” out to my many readers each week. I get some great feedback from gardeners everywhere telling me how they enjoy reading about my gardening adventures. There is never any advertising in “Dallying” and that leaves me free to comment on any plants or products that I am trialing. We do, however, try to make a living as a garden communicator. Many of you have subscribed to “Dallying” after you have heard me speak at garden club meetings or other venues. This is the time of year that organizations are filling up their speaking schedules for 2016. If you are in any way involved, or know those who are, with engaging speakers for your organization then I would appreciate you looking at my Speaker page on the website to see if there is anything that is of interest. Garden clubs, senior’s groups, company lunch and learn sessions or customer appreciation days are all places where my lively, informative and frequently humourous presentations have been appreciated. While you follow this link or one of the many others in ”Dallying”, take a moment to click on one or more of the Google Ads that you find there, they also generate income. Everything will be appreciated and allow me to continue. Enough with the editorial, let’s get back to the garden. 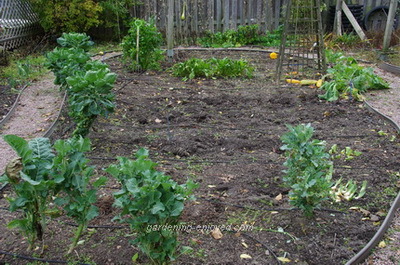 This is one section of the vegetable garden that is through the first phase of cleanup. The Potatoes have been dug up the Peppers and Eggplant have been harvested and turned into delicious delights to store for the winter and their plants have been chopped into the compost bins. The finished compost bin will be emptied onto this bed as soon as it stops raining and will lay there waiting for the worms and the weather to incorporate it into the soil. The Asparabroc in the foreground is producing well, now that the temperature has cooled and the Brussels Sprouts are tasting sweeter with each passing frost. The one big Celery on the left will be chopped into the soup pot later this week and the Rutabagas on the right will soon move to the cold room. My waning enthusiasm is always bolstered when I can look back at the results of a few hours of gentle exercise and see the rich soil hinting at next spring’s abundance. The expansion of my Dahlia collection this year was a great success. The house was filled with magnificent cut flowers from early August until the frost created the mush you can see. The stems have made their way to the compost bin and the tubers have been dug. It’s always amazing how big those tubers are. They were purchased as a few little bumps in a plastic bag and came back out of the ground, about now, as a large clump of tubers that make me wonder how I’m going to find big enough pots to start them next March. They are currently under the lights in the basement and as soon as the last of the soil on them is dry enough, it will be gently brushed off. Then into their cardboard box, a much bigger one than last years, and they will get tucked under some shelves in a cool part of the basement so that they can have a nice sleep while I’m skiing. They don’t go in the cold room because it can occasionally come close to freezing and they really don’t like to be that cold. If you look closely at the picture you can see the secret to great Dahlias, tomato cages. They were put in place when the little plants were planted and then the large stems grew up being supported by them and hiding them at the same time. Sue taught me that when I was admiring her Dahlias last year. Joan Asks? How late can you plant perennials and shrubs in the Fall? Ken Answers! Planting shrubs in the fall as long as the soil is still relatively warm will yield good results. Perennials vary, Peonies love fall planting while others will object. 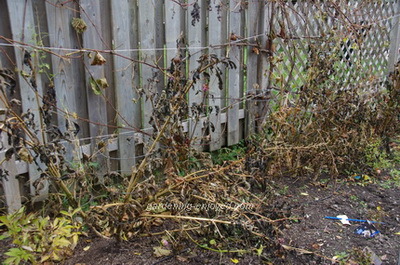 I would not transplant any perennials after your first killing frost. My exceptions are plants that are on sale for ridiculously low prices, late in the fall. I just feel it's worth the gamble sometimes.